See how the Urinal Flange Repair Kit works in our video below, with Chris Pofi, Operations Manager at Equiparts. 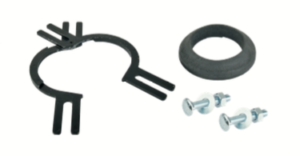 This Urinal Flange Repair Kit is a quick and easy kit that repairs 2” flanges without having to remove the original flange. This repair kit repairs both plastic and metal flanges, and comes with all the parts needed to repair your broken flange. The adjustable metal flange opens up and slides around the edge of the flange, between the broken flange and the urinal gasket. Close the adjustable metal flange, and install your bolts and voila! Your flange is now repaired. Want to share the Flange Repair Kit with a friend? Send them our 65784 Urinal Flange Kit PDF!